What we sometimes miss in Antwerp is that special harbour-city feel. You know that the harbour is there, but it’s far away from the citycenter and the hussle and bussle of the coming and going of the ships is missing. 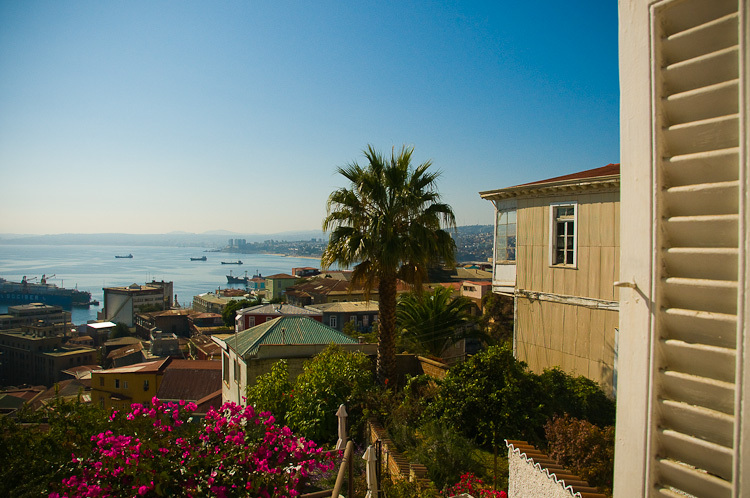 Here in Valparaiso, you look out of the window and you see the city below and a bit further the sea and it’s busy harbour. You hear and even smell the port. In the hills of Valparaiso, especially in Cerro Alegre and Cerro Conception, life goes a lot slower than down in the city center. Narrow street, colorful houses, more and more restaurants and bars…Good addresses to sleep are the newly opened Zero Hotel and a bit further down the road Casa Higueras. The last one offers a bit more classe with a nicely designed swimmingpool and a good restaurant with fantastic terrace and view on the city and port. A good up-to-date guidebook to discover the city is the blog Corrugated City. Matt moved from England to South-Amerika and made it’s way from Quito to Buenos Aires and finally ended here in Valparaiso. I completely agree. I love Valparaiso. It’s kind of reminiscent of San Fransisco in way with the steep hills and the single box car trains going up the hill. I really like that they’ve taken some of the old mansions and turned them into restaurants and boutique hotels.